Director – Byron Haskin, Screenplay – Samuel Newman & Francis Swann, Additional Dialogue – John Cousins, Producer – Sol Lesser, Photography (b&w) – Karl Struss, Music – Michel Michelet, Makeup – Don Cash, Art Direction – John Meehan. Production Company – RKO Radio Pictures/Sol Lesser Productions, Inc.
Melmendi has just been crowned queen of the Ashuba tribe but is threatened by her warlike neighbour King Bulam. Meanwhile, the villainous Radijeck has broken out of jail and sets out to deliver a shipment of guns to Bulam. However, their truck breaks down and Radijeck and his party are forced to continue on foot with native bearers. They are stopped by Commissioner Peters who demands to inspect their cargo but Radijeck shoots him. Tarzan becomes involved after finding the still alive body of one of Radijeck’s associates washed up down the river. He races to stop Radijeck before he delivers the guns that will allow Bulam to declare war on the peaceful Ashuba. Tarzan’s Peril was the fifteenth entry in the series of films that had begun with Tarzan the Ape Man (1932) at MGM featuring Johnny Weissmuller. 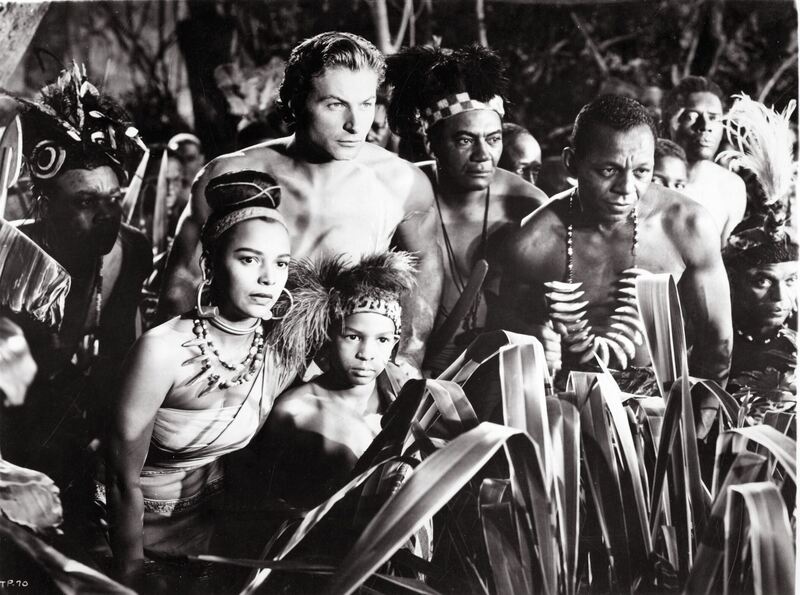 It was the third Tarzan film starring Lex Barker, who was Weissmuller’s immediate successor in the title role. With the seventh film, the series made a switch of studios between MGM and RKO Radio Pictures. By the time of Tarzan’s Peril, the Tarzan film had slotted into a familiar and well honed plot formula – Tarzan fighting white hunters/trappers/explorers (and for a slight variation here gunrunners) usually seeking treasure; Jane (or the girl of the show) abducted by the villain; lost tribes and cities; plots with simple-minded natives under threat; comic-relief antics with Cheeta; domestic harmony between Tarzan and Jane in the treehut. There is little that this offers to any of the usual. The plot is extremely forgettable – moreover, it is one that never even has Tarzan intersecting with the main action for half the film. One major difference is that this film actually went and shot in Africa – the first Tarzan film to do so. The African locations offer much more scope and realism to the backgrounds and animal footage in contrast to the usual cheap backlot adventures and stock footage that we had been given in all the Tarzan films up to this point. The biggest crime though is that the film is shot in black-and-white where you cannot help but think that a colour version would have been magnificent. The film was directed by Byron Haskin, who became a high-profile director of the era with the Disney Treasure Island (1950) and his works for George Pal, especially The War of the Worlds (1953). (See below for Byron Haskin’s other genre films). Under Haskin, the action scenes, including fights with the natives and a climax that involves Lex Barker swinging in on a vine from different directions to batter George Macready, are somewhat better than they were in most of the series. Lex Baker is his usual humourless self. The new Jane is Virginia Huston, a minor actress of the era of no particular distinction who proves to be one of the worst Janes in the history of Tarzan films. Hers is a Jane who could not be more unsuited seeming to the jungle life – someone who you can see being more at home dealing with society dinners and obsessing with the correct placement of a table placemats than living in the wild. On the plus side, George Macready makes an appealingly ruthless nemesis – one of the better among the usually forgettable villains that turn up in the MGM/RKO series. The other Lex Barker Tarzan films are:- Tarzan’s Magic Fountain (1949), Tarzan and the Slave Girl (1950),Tarzan’s Savage Fury (1952) and Tarzan and the She-Devil (1953). Byron Haskin is most well known for his work for George Pal with The War of the Worlds (1953), The Naked Jungle (1954), Conquest of Space (1955) and The Power (1967). He directed a number of other genre films including From the Earth to the Moon (1958), Captain Sindbad (1963) and Robinson Crusoe on Mars (1964), as well as episodes of the classic science-fiction anthology series The Outer Limits (1963-5).